Globally, pest and diseases reduce crop yields by 20 to 40% constraining global food security. The need for new sustainable disease control agents grows each year, driven by the need for greater production, climate change, pesticide resistance and toxicity to human health and environment. RNA interference (RNAi) or gene silencing is a powerful approach for combating biotic and abiotic stresses, but at present is limited in its adoption as genetically modified (GM) crops. A/Prof. Mitter and A/Prof. 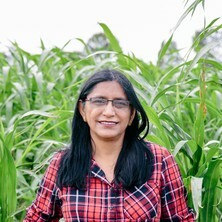 Xu (AIBN) secured Gates Foundation Grand Challenges Explorations Award (2012) (selected out of 2700 applicants, the only one from Australia in the field of Agriculture) leading to the development of ‘BioClay’ crop protection platform. It is a simple and elegant amalgamation of biology and nanotechnology to deliver RNAi as a non-toxic, non-GM, easy to adopt, environmentally sustainable spray for protecting crops from pests and diseases. BioClay innovation takes nanotechnology for delivery of RNAi for human therapeutics into the world’s first use in crop protection. BioClay technology is being further developed under A/Prof Mitter’s leadership of a global multidisciplinary consortium funded by Queensland Govt. Accelerate Partnerships (~$1.6m). It comprises academics from UQ (QAAFI, AIBN, SCMB, SBS and SAFS), international partners from USA and Africa and a strong industry partner. The ‘flow-on’ impact of BioClay will reduce pesticide usage, reduce toxic run off to our precious waterways enhance the clean green image of produce and lead to economic prosperity and jobs for future. Prof. Mitter is also leading the development of silica vesicle based vaccine delivery platform in collaboration with Prof Yu at AIBN. This novel platform targeting animal health circumvents the challenges of multiple doses, cold chain requirements and adjuvant toxicity concerns posed by current vaccines. A global consortium funded by Queensland Govt, School of Global Animal Health, Washington State University and pharmaceutical company Zoetis (~$ 3.6M) has generated proof of concept with significant diseases of interest to the cattle industry including Bovine Viral Diarrhoea Virus and Cattle Tick Fever. The excellent research has resulted in 2 patents, one commercial lock-out agreement, 3 PhDs and 11 publications in high impact journals: The vision moving forward is to target key animal health issues of $12.6b beef, $3.9b sheep, $3.4b pork and $1.1b aquaculture industries in Australia. Nanovaccines for animal health will result in multiple benefits including estimated revenue generation of $2-5m / disease target. Prof. Mitter’s research on various aspects of avocado improvement is poised for a significant impact on avocado productivity. Retail value of $767 million with Queensland contributing to 50% of this production, increasing local demand (3kg/year) and opening up of Asian markets for consumption as the sought after health food calls out for innovation to sustain productivity of the rapidly expanding avocado industry. Avocado is a grafted tree and good quality disease resistant rootstocks are integral to increased productivity. Clonal propagation of avocado rootstocks in Australia currently follows a 40 year-old practice that takes ~18 months to generate field-ready trees, at high cost. The pioneering research in Mitter lab supported by ARC linkage (~$ 600k) has led to the world’s first use of PLANT STEM CELLS, or meristems, for clonal propagation of avocado. It has the potential to be a “game changer” for avocado growers by halving the time and cost to supply disease free clonal rootstocks. Mitter lab is also exploring nanoparticles to deliver RNA to promote rooting in avocado. As an epicentre of subtropical agriculture, Queensland is in a unique position to benefit from this UQ led research including capturing a bigger share of the global markets, particularly Asia. Molecular regulation of phase transition and flowering in tropical/subtropical tree crops. Cryopreservation of Avocado shoot tips for the conservation of Persea Germ plasm. Characterisation of putative pathogenicity SIX genes in Fusarium oxysporum f.sp. cubense.